The EU-LAC agreement signing is commemorated by Mrs. Paolo Amadei, EU-LAC Foundation executive director and Hon Mark Brantley, Minister of Foreign Affairs. BASSETERRE, St. Kitts — In a brief yet symbolic Feb. 12 meeting between the Minister of Foreign Affairs and Aviation, the Honourable Mark Brantley and the Executive Director of the EU- LAC Foundation, Mrs. Paola Amadei, Minister Brantley announced the Federation is delighted to have recently ratified the Agreement that established the EU- LAC Foundation as an International Organization. 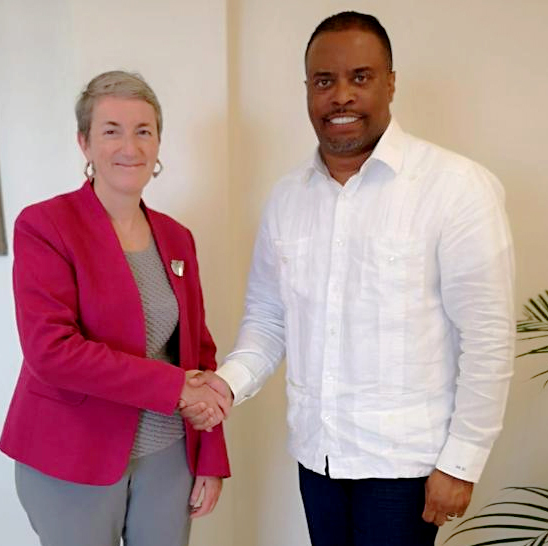 Executive Director Amadei, during her first visit to the Federation, welcomed the news and thanked the Government of St. Kitts and Nevis for reposing its confidence in the Foundation with the ratification. Mrs. Amadei praised the Federation for being the first OECS country to ratify this important document, paving the way for other territories in the region. St. Kitts and Nevis’s ratification is indicative of the country’s commitment to further strengthen and deepen relations between Latin America and the Caribbean and the European Union, as both regions continue to work collaboratively to advance the lives of their people, through the exchange of knowledge and cooperation. The EU-LAC Foundation’s headquarters are in Hamburg, Germany.